Located just across the bay from downtown Astoria, Ore., Clatsop Power Equipment, the cover story for PET’s December 2017 issue, has been a local lawn and garden power equipment fixture for 31 years after owner Fred Mestrich opened his shop at the Miles Crossing Hwy. 101 intersection in 1986. Northwest Oregon is a beautiful part of the world and features compelling small engine market conditions. For example, some of the world’s most productive and well-managed forests are just outside Clatsop Power’s back door, where despite increased mechanization pro timber fallers remain a big part of the business. Meanwhile, just outside the front door is a world of water, where the mighty Columbia River plunges into the Pacific Ocean, creating a myriad of opportunities for Clatsop’s outboard engine dealership that sells to traditional customers such as fishermen and duck hunters, but also to niche markets such as oyster farms. Mestrich brothers and informal collectors Gregg , left, and Bryan, right. Mestrich’s wife, Ann, and two sons, Bryan and Gregg, all play important roles in the business, with Ann helping with the bookkeeping, Gregg managing the sales and service efforts of Clatsop’s longtime Evinrude boat motor dealership, and Bryan moving into more of a leadership role in the showroom and parts counter the past few years after working 25+ years in the service department. Saw display shows decades of small engine technology—and don’t forget the misery whip! 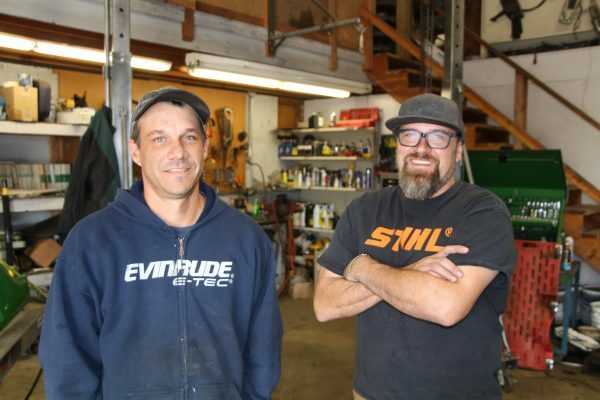 During their long careers in the family business, both Gregg and Bryan have put their hands on and come across lots of equipment, some of it old and antique. They’ve held on to some of the older stuff, and in their spare time have done some restoring and displaying. Many dealerships have a piece or two of older equipment here or there, but the Clatsop collection is notable because it’s larger than most dealerships (at least what’s on display: PET editors have seen some mighty big chain saw graveyards over the years.). Plus, the older outboard motors offer a nice touch. 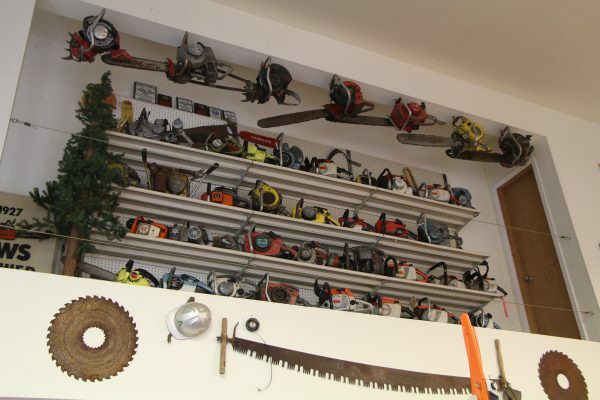 Like most dealerships, there’s not much time or space to create museum-quality displays, but the saws and outboards provide a nice window into small engine history. Antique boat motor display includes restored Johnson Sea Horse. While the headline piece might be the 8 ft. Disston two-man saw that’s so big it lays across the top of the parts cabinets behind the parts counter, other notable saws include an IEL two-man unit, Orline “Mustang” chain saw, Pioneer Farmsaw, Homelite C-91 (among multiple early Homelites) and early Stihls. (And don’t forget the “misery whip” saw on display as well.) 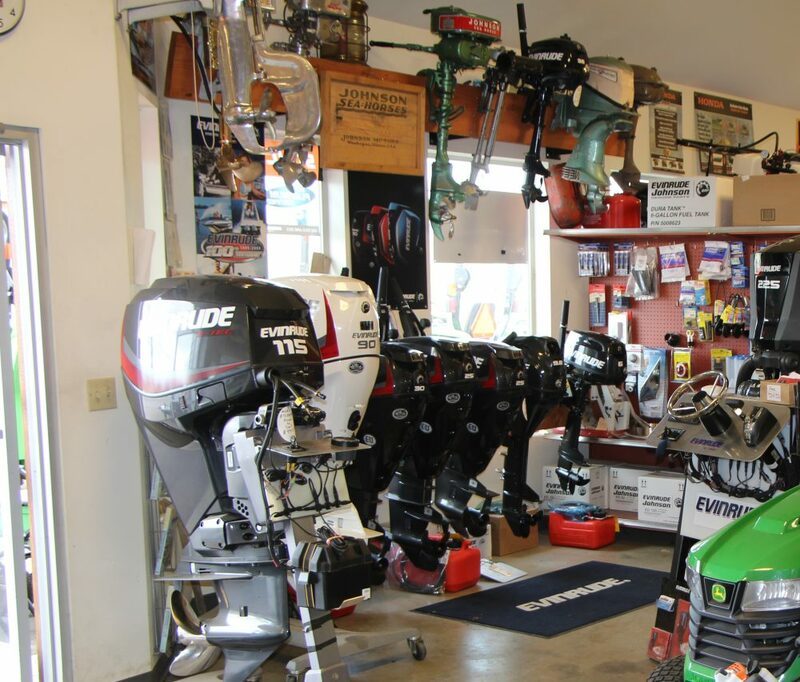 The outboard collection, though smaller, includes a fully restored Johnson Sea Horse among several antique Evinrudes.